Explore the isolated natural beauty and culture of the region located behind the lofty white Himalayas that is purely mesmerizing and riches with rare herbs, miraculous lake and wild animals then, Upper Dolpo Trek will be the wonderful option to get experience. Trekking to Dolpo region was opened after 1989 to the foreigner tourist. Whereas special permits are still required entering in this restricted region. Oscar Award-winning movie, The Caravan (Nepal's first English subtitled film) was shot in Dolpo. Likewise, the Snow Leopard (Book by Peter Matthiessen), also made Dolpo region popular and familiar among the backpackers. 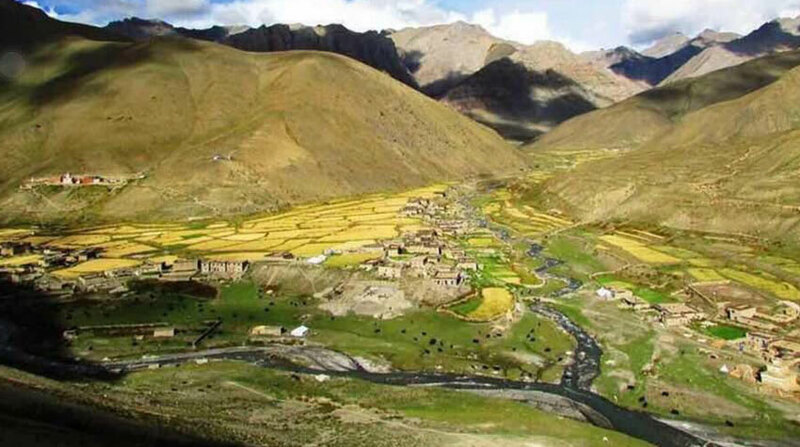 Matthiessen describes his marvelous experience in the beautiful region of Dolpo. Upper Dolpo Trekking is one of the most interesting trekking destinations near the Tibetan border in western Nepal. Since the place is situated behind the lofty white peaks, raining occurs rarely making the hills bare with little vegetation. Phoksundo Lake (the deepest lake of high altitude in the world), Dho Tarap (a human settlement at the highest altitude in the world), and Shey Gumba (religiously the most important Gumba in Nepal) are the gems of Dolpo trekking. Also, the forest of Upper Dolpo is home to rare plants like Yarsagumba, Jatamasi, Panchaunle, Chimailo, and many more. Trekking to Upper Dolpo commenced with an hour of flight to western Nepal at Nepalgunj. Again fly to Jhuphal and arrangement of porters and gears will be taken place. Jhuphal is the trekking starting and finishing point of Upper Dolpo Trek. It is better to do this trek in the months of March to September. After September, it starts snowing heavily and trekking is only possible with heavy gears and equipment. After November it is completely impossible for trekking. The best time is from March to May, as it may rain in June and July. Day 02: Fly to Juphal. Max. Altitude: 2,475 m (Juphal). Day 03: Trek to Chhepka. Trail Attractions: Big Suspension bridge, enter Shey Phoksando National Park, Pine, Juniper, and Bamboo Forest. Max. Altitude: 2,838 m (Chhepka). Day 04: Trek to Palam. Trail Attractions: Reechi Village, stone staircase, dense forest, and Amchi Hospital. Max. Altitude: 3,820 m (Palam). Day 05: Trek to Phoksundo Lake. Trail Attractions: Pungmo Khola, Phoksundo Lake, Nepal's highest waterfall, Ringmo Village, Chortens, and Mani Walls. Max. Altitude: 3,620 m (Phoksundo). Day 06: Explore the area. Trail Attractions: Short hike to the village of Ringmo and it’s Tibetan Buddhist Monastery. Day 07: Trek to Salla Ghari. Trail Attractions: Enter Forbidden Upper Dolpo region, view of Kanjirowa Himal, and Sheep meadow. Max. Altitude: 3,640 m (Salla Ghari). Day 08: Trek to Lar Tsa. Day 09: Trek to Shey Gompa. Max. Altitude: 5,360 m (Kang La Pass). Day 11: Trek to Namgung. Trail Attractions: View of Tibetan plateau. Max. Altitude: 5,000 m (Sheyla pass). Day 12: Trek to Saldang. Max. Altitude: 4,046 m (Saldang). Day 13: Trek to Sibu. Trail Attractions: Chortens, Mani Walls, Stupas, Terrace Fields, and Monastery. Max. Altitude: 4,000 m (Sibu). Day 14: Trek to Jengla Phedi. Max. Altitude: 4,480 m (Jengla Phedi). Day 15: Trek to Tokyo Gaon. Trail Attractions: Dhaulagiri Massif, Jeng La, and Tarap Village. Max. Altitude: 4,240 m (Tokyo Gaon). Day 16: Trek to Dho Tarap. Trail Attractions: Mani Walls, Chortens, and Gompa. Day 17: Trek to Sekam. Trail Attractions: Tarap Khola, Blue Sheep, Yaks, Goats, and Suspension Bridge. Max. Altitude: 3,623 m (Sekam). Day 18: Trek to Tarakot. Trail Attractions: Lush Forest, Sandul Gompa, and Bheri River. Day 19: Trek to Dunai. Trail Attractions: Completed a circuit. Max. Altitude: 2,109 m (Dunai). Day 20: Trek to Juphal. Day 21: Fly to Nepalgunj then to Kathmandu. Flying: 30 mins to Nepalgunj / 45 mins to Kathmandu. Drop to your hotel. Upper Dolpo Trekking Finished here! Wants some modification on Upper Dolpo Trekking itinerary? contact us to customize it.